I read this article and found it very interesting, thought it might be something for you. The article is called In Defeat, BJP’s Voter Base Stays Loyal and is located at https://archive.indiaspend.com/cover-story/in-defeat-bjps-voter-base-stays-loyal-11420. 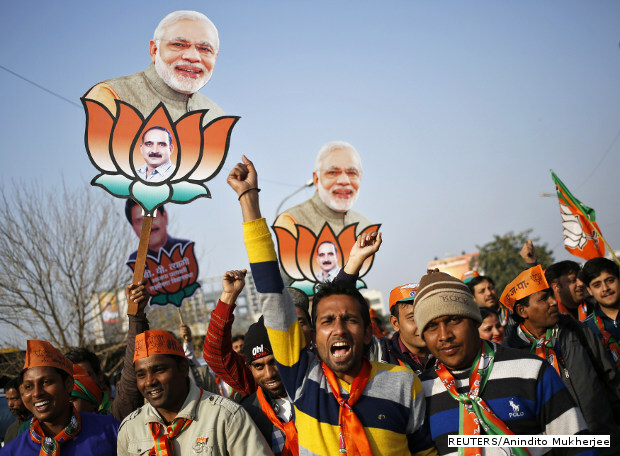 Despite its overwhelming defeat, reduced to three seats in the 2015 Delhi assembly elections, the Bharatiya Janata Party (BJP) has largely maintained the vote share it has had for the last 16 years. The BJP achieved a vote share of 32.20% this time around, the lowest since 1993 but around the same it’s been since 1998, indicating the presence of a loyal voter base. The BJP was reduced to just 15 seats in 1998 from 49 in 1993. The weak show continued till 2013 with the BJP being in opposition for 15 years. The party’s seat share increased 35% when it won 31 seats in 2013, compared to 23 in 2008. The wide variation in seats, despite steady voter support is explained by India’s first-past-the-post electoral system. As for the Congress, this has been its worst performance ever, its vote share reduced to just 9.7% and no seats. The Congress defeated the BJP in the 1998 elections by winning 52 out of 70 seats. This ushered in the rule of Sheila Dikshit as Chief Minister, under whose leadership the Congress subsequently won 47 and 43 seats in 2003 and 2008, respectively. The 15-year reign finally came to an end in 2013 after strong anti-incumbency sentiment led to the emergence of AAP and re-emergence of BJP as front runners in Delhi’s political arena. The year 2013 also saw a massive drop in Congress seat share, falling 81% and reducing it to just 8 from 43 seats in 2008. The 2013 election resulted in a hung assembly with BJP winning 31 seats and AAP 28. Congress emerged as king-maker when its outside support allowed AAP leader Kejriwal to form a government and become Chief Minister. The fall of the Congress and–in relative terms–the BJP, is balanced by the mercurial rise of the AAP, which has seen an increase of 139% in seat share from 28 in 2013 to 67 in 2015. The AAP has now won a landslide victory, claiming 67 of 70 contested seats, making deep inroads in BJP and Congress strongholds, winning with big margins. Of the BJP’s three seats, one, Mustafabad, was snatched from the Congress. It has retained only two seats from 2013, Shahdara and Vishvasnagar. What is the number of votes bjp has garnered. Bear in mind that over all voting percentage was high and therefore a meare percentage alone will not reflect the right results. while the percentage has shrinked for them, i feek they have got more votes due to increase in voting percentage.